The All Blacks scored five second-half tries to beat the Wallabies 38-13 in Sydney on Saturday. SIMON BORCHARDT reports. For 39 minutes of this match, it looked as if the Wallabies might take a step towards ending their 15-year Bledisloe Cup drought. But the All Blacks, as they so often do, changed the complexion of the game with tries just before and after half-time. They were gifted a third try soon after and that, as far as the result was concerned, was that. 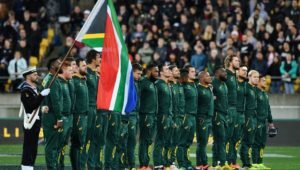 The Wallabies defended well in the first half, with their linespeed forcing their opponents into making uncharacteristic errors, but that effort clearly took its toll in the second half. The hosts also struggled at the set pieces, losing seven of their lineouts and conceding a couple of scrum penalties. The Wallabies began the match in confident fashion and took a deserved 6-0 lead after 21 minutes. When the All Blacks eventually got themselves into a good attacking position they lost a 5m lineout, and their frustration continued as Waisake Naholo was bundled into touch in the right-hand corner, a Tatafu Polota-Nau breakdown steal ended a 17-phase attack, and Beauden Barrett was off target with a 40m penalty-goal attempt. But then came that double blow. First, Ben Smith broke through Lukhan Tui’s tackle attempt on the Wallabies’ 10m line and offloaded in contact. 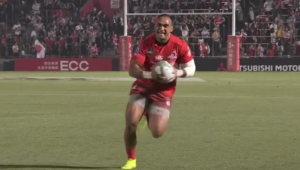 Naholo did well to get the ball back inside to Kieran Read, who gave the try-scoring pass to Aaron Smith. Smith nabs one for the @AllBlacks! Wallabies hold 6-5 lead at the main break. Then, just two minutes into the second half, Naholo ripped the ball off Marika Koroibete on the All Blacks’ 22. It was sent wide to Rieko Ioane, who took play up to the Wallabies’ 10m line before putting Jack Goodhue away for his first Test try. Barrett’s first successful goal kick of the night made it 12-6. Barrett then struck a killer blow in the 52nd minute when he kicked ahead a loose ball, which had been dropped by Dane Haylett-Petty, and regathered it just before the tryline to score. The All Blacks extended their lead to 20 points when, following a break by Barrett, Brodie Retallick threw a dummy – that forced Foley to commit to Naholo – and raced away. 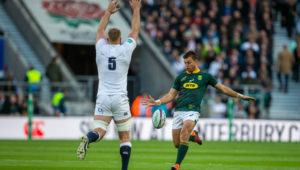 The Wallabies responded with a length-of-the-field try, which began with an intercept from Michael Hooper inside his 22 and finished with Jack Maddocks dotting down. But the All Blacks finished strongly, with two tries from Naholo blowing out the scoreline. The wing chased down Barrett’s kick deep into Wallabies territory to get his first and then picked up a loose pass and cut inside past three defenders for his second. 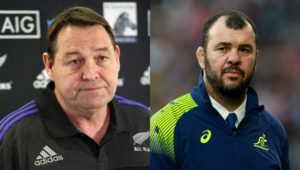 The All Blacks have now won a record 13 consecutive Tri-Nations/Rugby Championship matches, and will be expected to make it 14 against the Wallabies at Eden Park next weekend. Wallabies – Try: Jack Maddocks. Conversion: Bernard Foley. Penalties: Reece Hodge, Foley. All Blacks – Tries: Aaron Smith, Jack Goodhue, Beauden Barrett, Brodie Retallick, Waisake Naholo (2). Conversions: Beauden Barrett (4). Wallabies – 15 Israel Folau, 14 Dane Haylett-Petty, 13 Reece Hodge, 12 Kurtley Beale, 11 Marika Koroibete, 10 Bernard Foley, 9 Will Genia, 8 David Pocock, 7 Michael Hooper (c), 6 Lukhan Tui, 5 Adam Coleman, 4 Izack Rodda, 3 Sekope Kepu, 2 Tatafu Polota-Nau, 1 Tom Robertson. Subs: 16 Tolu Latu, 17 Allan Alaalatoa, 18 Taniela Tupou, 19 Rob Simmons, 20 Pete Samu, 21 Nick Phipps, 22 Matt Toomua, 23 Jack Maddocks. All Blacks – 15 Ben Smith, 14 Waisake Naholo, 13 Jack Goodhue, 12 Ryan Crotty, 11 Rieko Ioane, 10 Beauden Barrett, 9 Aaron Smith; 8 Kieran Read (c), 7 Sam Cane, 6 Liam Squire, 5 Sam Whitelock, 4 Brodie Retallick, 3 Owen Franks, 2 Codie Taylor, 1 Joe Moody.